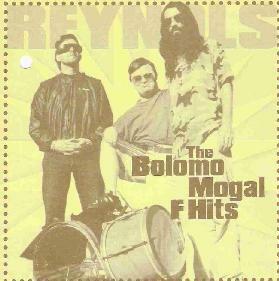 Reynols - "The Bolomo Mogal F Hits"
This gathering of freaks from Argentina have compiled a very strange musical experience for your ears. It is rare that I get something that is so totally alien and strange that I wonder what the hell is going on. This is not music to be tripping on or stoned. These guys were probably really stoned though. This is some bizarre stuff from slow drone songs like Manisero Mufuso to pure noise like Depedidos Banda, to minimalist spaceout things like Dijos Canisocios Roto, drunken rock... It is some of the strangest stuff I have heard in a long time. If you are up for a challenge or just want to hear something extremely strange, check this one out! Visit the Audiobot web site at: http://www.freaksendfuture.com.